Is anyone playing this game yet? I started the other day and I love it, however, I am stuck and can't seem to get through a certain part. I'm not sure how to explain it so I won't unless there is someone on the boards that is playing. Thanks. Why resist temptation? There will always be more. Don Herold. The telephone is at the restaurant-bar where Grandpa is the bouncer. It's clear for me with the telephone, I've met Grandpa already, but Broadstairs Chamber? I think I'm a little behind, I saw Smoos only in the rooms with the boxes, probably have to do something else at first. Going back. I think you might have missed the exit to the right of the buildings to another area. The exit looks like a railroad bar. Love the game. It was fun after I got used to hiding from Snoozles the blaster. I tried this exit once and it was locked, going to try it again now, may be after stabilizing the vortex it'll be open. I like this game too, it's fun and very forgiving on the easy level. I know. That's where I got stuck for a long time - going around in circles. 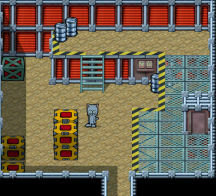 Now I'm in the storage room with the robots trying to set EMP mine. After pressing E key nothing changed with robots and no interaction was possible.What am I doing wrong? Where should be Ed? I placed him next to the robot in the bigger upper room. Edit: Please disregard this question, I got the power cell. Springchicken! Take care of those robots especially the red ones. Fix the red key, which will get you into the factory. The gliding regular robots - use the EMP when they are at least bunched together. The red robots need a upgraded EMP, I think. The spiked bombs can be removed with the ground mines. Thanks for helping us here, Steve. My memory is never good if I don't write it down. and I didn't do it for this game. Just played and ENJOYED it. Sorry, did the last one in a rush - putting together the latest Mr. Smoozles strip. Once you have fixed the red key you can get into the factory, which is where the white key card is and the next Vortex. Thank you very much Diamond and MaG for helping me. 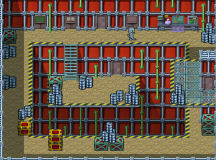 I've been to the factory, found more tasks to do, got 1 ground mine in inventory. EMP - I used one, can I get more the same way as the first one? Going back to place the ground mine and maybe got more. I do appreciate your helpfull hints. Didn't see your last post Steve. I missed somehow the white card in the factory, so going back and will look for the vortex too. Thanks again. I need some more hints please. 1. How can I reach the key in the vortex? Where in the factory is the white card? I had some fun blasting the robots and spiked bombs, powered one computer in the factory, didn't get anything useful from it yet. Thank you. Sorry, I read the post earlier. Thought about the answer and I really thought I posted it. 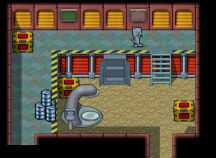 The key in the factory is on a wall above sunken floor where the teleporter is located. Stabilize the vortex and the key will appear in another place; then you can pick it up. I know I want too much from you, but I'm still stuck. I need to stop the vortex to get the key. I collected all pink crystals I could find and it's not full yet. I saw one more crystals in the room which I can't reach. I need the white card to open the door. This card is somewhere in the factory. It's like a circle - I need the last crystal to get the key but I need white card to get the last crystal. Could you remember where is white card? It's taking all fun away to be stuck so often. Sorry for my complaining. There are enough Vortex Fragments in the Factory to fill the Vortex Core. There are two in the small room in which Gladys is working. There's one on the left and there should be one under the metal ramp to bottom right. [QUOTE] Stabilize the vortex and the key will appear in another place; then you can pick it up. I stabilized the vortex and the key was still on the same unreachable part of the wall. I returned through the portal back. Maybe I just should waite for the WT, it seems this game is too much for me. When you stabilise the Vortex it closes down when you next leave and places the key item in the "real" world (in the Reactor room). Just to clarify - when you filled up the red jewel collector - He will say that it is now filled up. Then go back to the vortex. Place that filled collector where you got it from. Exit the vortex and the vortex closes. You can then hunt for the key wherever it landed in the real world. I'm a little stuck in the sewer.I powered 2 consoles there, talked to the Rat but didn't get any bait. I didn't find the console which needs the code. Where is it? Activated some of the green lights. The one on the right from the gate didn't respond. When you have fitted the two power cells in the sewer you need to interact with the two buttons near each one quickly enough to turn on the red buttons on either side of the gate. You then need to interact with both of these buttons within a short time to open the gate. Ok, help please. I cannot get out the gateway to the right in the village. I think I have done everything I can do. I am currently trying to fix the red key. The village gateway says I need a password, but so far, I can't find it. Been wracking my brains here, L4L. Can't remember. Can you send me that save game and I'll see. EDIT: Have you tried the prison contol monitor? This is the same password you need to destroy the mines near Pru, which you get from Stu. Just a minute, if you have the red key you should already have this password. Thanks Mag and Steve, Blame this one on my leaking brain and a visit to the dentist. So have now gotten through that gate and feeling very stupid. So sorry and thanks for the quick reply. I installed the displacer upgrade for reality enabler, need the deactivation code for turning off the force field in the broken garden, which I'm supposed to get from the console in the sewer. But it doesn't work. Maybe some other console or I missed something else to do? Thank you. I think I got stumped here too. Try pressing the D key when you get to the other side and in the broken garden. I'm a little lost at the end. What am I supposed to do after I fixed and sent away Mr.Smoozles? All consoles I tried to interact with didn't say anything new. I also can't find the last 2 crystals. You will continue when you get the last 2 crystals and get the vortex stabilized. Now I got the glitch at the last seconds of the game. When I returned to the prison suddenly the error message came up and after I pressed 'enter' the screen went to Windows. There is a new version of the game that fixes this problem. Download and install it from the Juniper Games site and load up yourlast save game before entering the prison. Just checking before I do this. The new version of the game is the one that says, "Download Mr. Smoozles Goes Nutso (15.2 MB)"
Will I need my registration key for this new version? I don't need to move my saves to a different folder before doing this? My saves should still work after upgrading? Yes, that's the one. I just replaced the previous file with this one. Just install to the same directory. Whether you should move your save files first depends on how paranoid you feel - sometimes I think that my computer is out to make my life hard and always err on the side of caution. Your save game files will work with this version. I need to fix the red key, and I need a power cell (I think from one of the functioning robots) to do that. But whenever I try to "interact" with a functioning robot, it just shoots me. I wish the robots were a little more cuddly. I also have acquired software to hack into Watford's computer files (and Ed seemed like such a law-abiding young cat -- you just never know) but Watford's computer won't cooperate with me. It just sits there, ignoring my use of the "enter" key. You need to get an EMP mine to take out the robots. You can then interact with them and take their power cells (one at a time). If you already have the phone number from Watford's computer you won't be able to interact with it again. Did you get the password from Watford himself? I don't think I have an EMP mine -- how do I get one? I'll go back and try the telephone again. If you have the phone number and the phone card you should get a message from an answer machine. You get the EMP mine from the stores, but you need a chit from Boo in order to do so. Ok, I can't find enough Vortex Fragments in the factory to fill the Vortex Core. Actually looking in my inventory, it looks like all the bars are full, yet I can't use it in the Reality Vortex. Oh, and yes, I got the one under the ramp already. Legolas, when you have enough, you'll get a message saying that. It sounds like you need 1 more. Have you backtracked to all previous locations? I did not write down where they all were, but I do remember they were scattered throughout. I finally found it! It was hidden behind a wall. Well, I'm seriously stuck still. I finally took a wide open look at game's Hint page, and I think what I need to do is to find the Reality Vortex. Somehow, I've misplaced it, or to be more accurate, it has completely escaped me. Whereabouts are you? Which Reality Vortex are you looking for? It seems like I'm at a Catch-22 here. To get a power cell from the robot I need to modify the ground mine with the displacer which I have. However, without the power cell I cannot make the displacer mine. I think I've reached the end of the line with this game. Use a ground mine to destroy a robot. Get the robot's power cell. Get another ground mine. Go to the work bench. You can use that mine in a room with the robots- I used it in Broadstreets chamber (I think) and it discombumulated those robots. That gave me 3 power cells to use for other things. Eventually, I got another one from the supply and used it on the robots in the village too. You can only pick up one power cell at a time.